Tweed, A. D. (2016). Report on the JASAL 10th Anniversary Conference, 2015. Studies in Self-Access Learning Journal, 7(1), 60-68. The JASAL (Japanese Association of Self-Access Learning) 10th Anniversary Conference was held on December 12th, 2015 at Kanda Institute of Foreign Languages (KIFL) in Tokyo. JASAL was established in 2005 by Garold Murray and Lucy Cooker to promote self-access learning in Japan. 2015 marked the first year that the event was held as a stand-alone conference; from 2006-2014 the JASAL Forum took place at the JALT (Japanese Association for Language Teaching) annual national conferences. More than 50 participants attended the 2015 JASAL conference, which began with a guided tour of KIFL’s self-access facilities. The conference featured 12 presentations on a variety of topics related to self-access learning. In this conference summary, the presentations are grouped into four sections: integrating self-access and curriculum; learning spaces; activities and events; and focus on individuals. At the end of the article, the author considers future directions for the JASAL Conference. JASAL (Japanese Association of Self-Access Learning) marked its 10th Anniversary with a first ever stand-alone conference. 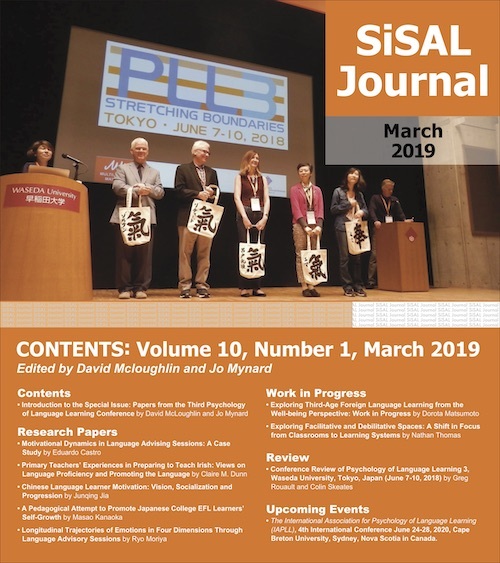 This conference stood out from past JASAL forums in that it did not coincide with the Japan Association for Language Teaching (JALT) national conference, lasted an entire day, and had more presentations than previous events. Held at Kanda Institute of Foreign Languages (KIFL) in Tokyo, the conference began with a guided tour of VISTA (Village of Innovative Study and Training Access), KIFL’s self-access center (SAC). After some discussion time, the morning concluded with two 20-minute presentations. The afternoon started with four fast-paced, 10-minute pecha-kucha presentations, in which the presenters’ slides change at a rather quick, predetermined rate. To conclude the conference, six 20-minute presentations were given. Although not officially part of the conference, some participants stayed at KIFL for an annual JASAL report which was delivered by its President Katherine Thornton, Vice President Dirk MacKenzie, and Membership Chair Hisako Yamashita. As this conference was about self-access and autonomous learning, all of the presentations, in various ways, were concerned with helping learners to take control of their own learning (Benson, 2011). However, the presenters approached self-access learning from a variety of perspectives. The first part of this summary includes presentations about integrating self-access into an institution’s curriculum. As SACs exist within larger learning institutions, it is important to consider how they provide connections with classroom learning (Cotterall & Reinders, 2001; Reinders, 2012). In the second section I report on presenters who focused on learning spaces, including the establishment of new SACs. The examples presented would fall under Gardner and Miller’s (1999) distinction of controlled learning environments, in that materials are provided in an organized manner. The theme of the third group of presentations is activities and events. As the social aspect of learner autonomy has become increasingly emphasized (Murray, 2014), these presentations dealt with ways of bringing students together. Finally, the last section focuses on individuals. These presentations zoom in to describe how certain learners have become more autonomous. Herman Bartelen of Kanda Institute of Foreign Languages in Tokyo presented about Language Learning Foundations (LLF), a course on self-directed learning for first-year students. LLF focuses on principles of self-directed learning, including goal setting, time-management, reflection, motivation and learning strategies. Course materials for LLF included print and digital materials. All students and teachers received iPads for the course and these included apps such as Quizlet, dictionaries and graded readers. The written and digital materials also included pages to help students to self-direct their learning. One page entitled the PAR cycle explains the process of Plan, Act and Reflect. Related to reflection, another page shows how learners utilize the Wheel of Language Learning (Kato & Sugawara, 2008, as cited in in Yamashita & Kato, 2012) to evaluate their past English learning experiences. Other pages in the materials give students help with scheduling their learning and with employing specific learning strategies related to language skills. Bartelen concluded by discussing some of the positive and challenging features of the LLF course. The main advantage was that it exposed learners to a range of effective practices related to self-directed learning. In addition, the course ensured that all students were introduced to KIFL’s self-access materials and facilities. Regarding challenges, for some teachers and students there was still some resistance toward LLF, and concepts about learning how to learn remain abstract to some. Another issue was that it was difficult to find good activities based on learning how to learn. Despite these challenges, Bartelen believes that LLF provides additional support to learners who engage in learning outside of the classroom. Dirk MacKenzie and Brian Nuspliger of Konan Women’s University in Kobe reported how self-access learning components were integrated into the curriculum of first and second year English courses in the department of English Language and Culture. Each semester, 20% of students’ grades in the Production and Fluency course come from completing activities connected with the university’s SAC, e-space. For two semesters, students did extensive reading and completed quizzes. During the other two semesters, students had to get stamps for completing various self-access activities, such as attending advising sessions, visiting the English cafe, and participating in e-space activities and events. MacKenzie and Nuspliger presented data on students’ attitudes and their usage of e-space and its resources. In general, students had a positive attitude toward the SAC, with most agreeing that the stamp system was helpful for learning about e-space, that advising was helpful, and that going to the English Cafe was good for their English. While students indicated that that extensive reading was good for their English, the majority expressed that they would not continue doing it in the future. The presenters also reported that less than a third of available advising sessions were booked by students. On the plus side, student numbers at the English Cafe have generally increased over the past five years. Kirby Record, Makiko Hori, and Ryosuke Saito of Yamanashi Gakuin University discussed the connections between the Language Acquisition Center (LAC) and the International College of Liberal Arts (ICLA), both of which were launched in 2015. While the LAC, a self-access center, provides autonomous learning support for drop-in users, students in the ICLA are also required to use it as part of their required coursework. For these students, 10 periods of traditional classroom learning is supplemented with four periods in the LAC. The work ICLA students do in the LAC is coordinated with other English courses, and it also includes advising sessions. Record, Hori and Saito concluded by reporting on the positive effects of LAC use for ICLA students. One benefit is that students are better able to manage their own learning, including time management and decisions about which skills to focus on. Students also demonstrated greater awareness of learning strategies and selecting materials. Finally, as the LAC holds events such as workshops and lectures, the center is becoming more of a community in bringing teachers and diverse groups of learners together in one common space. Chris Fitzgerald and Rachelle Meilleur presented about their work in Kyoto University of Foreign Studies’ SAC. The SAC, which is known as NINJA (Navigating an Independent Non-stop Journey to Autonomy), was opened in 2014. In addition to providing opportunities for language exchange with foreign students, NINJA provides an advising service and support for improving writing and speaking skills. The presenters mentioned a number of challenges related to the speaking and writing sessions, including scheduling issues and providing appealing topics for students in the speaking sessions. NINJA has introduced a trial system for two classes which introduces new students to the idea of independent learning. After receiving an orientation to NINJA, students are asked to write a language learning history, create a student profile and schedule, and make a learning plan. Once they begin putting their plan into practice, students reflect on their work and receive feedback from a NINJA teacher. While some students have found this process of self-directed learning to be time-consuming or boring, most of them found it useful, with some commenting that they study more when they enjoy what they are doing. Clair Taylor of Gifu Shotoku Gakuen University discussed an English language space that was set up in an elementary school for students to speak English outside of their classrooms. Having experienced success in implementing a speaking lounge at a university, Taylor wished to provide a speaking space for younger students. Taylor discussed a number of its characteristics which both English spaces shared. These include affording students the opportunity to use English freely, having a sense of community, promoting autonomy and incidental learning, and having a human-centered design with support staff. After much planning and discussions with stakeholders, English World was launched, with an accompanying website and social media such as Facebook and LINE sites. The English World space is outdoors and it provides students with ample room to play and work in groups. Despite being a rather large area, the school provided a single picnic table as the English Space furniture, which makes it challenging to organize certain activities and games. As English World is intended to be an English only zone, one of its aims is to introduce language required to carry out different activities, games and songs. The English only rule and other policies, such as the avoidance of swearing, are made known to the students. At the moment, Taylor is engaged in training volunteers and carrying out action research on English World. Keiko Omura reported on the Language Lounge (LL) at Toyo Gakuen University in Tokyo which was set up about seven ago. Omura explained that the LL is a space where students can relax and learn languages, and receive support in becoming more active and independent learners. Teachers work as facilitators in the LL and various cultural events are held to motivate the students. According to LL records, which are based on a stamp card system, usage of the LL is down from 2011. This has triggered the LL to investigate why students come to the lounge and what skills they wish to work on there. The top three reasons students come to the LL are to talk to teachers and interns, to get to know other students, and to relax with friends. The overwhelming majority of students say that what they most want is to practice speaking in the LL. Omura proposed a number of ways to increase the usage of the LL. These include clarifying the purpose of the lounge, teaching methods of self-study, organizing a peer support system, and holding workshops on life skills. The LL hopes to develop and attract more independent learners. Yo Hamada discussed the Autonomous Language Rooms (ALL Rooms) at Akita University. The ALL Rooms has been open for five years and is run by 10 students and three teachers. A self-access center, the ALL Rooms contains materials which help students with the four macro skills, grammar, vocabulary and TOEIC and TOEFL preparation. The ALL Rooms also provides advising services for students to help them with independent learning, including selecting appropriate materials. A number of activities and events are offered by the ALL Rooms. These include a conversation circle, a potluck lunch, and a Halloween party. Also, there is a multi-day English camp which is held in February. In 2015, students from ALL Rooms went to high schools to make connections between the university and young students. Yaoko Matsuoka presented about the Language Learning Center (LLC) at the Yokohama office of Kokugakuin University. The LLC’s aims include promoting learner autonomy, providing a suitable environment for communication and offering non-credited courses. Among the activities and services at the LLC are advising, conversation practice and e-learning. Matsuoka identified some problems affecting self-directed learning, such as students’ limited amount of time and the inconvenient location of the center itself. She also said that some students may lack intrinsic motivation to study or have little awareness about how to learn on their own. Matsuoka believes that advisors can offer support to learners by motivating them and making them more aware of the language learning process. Kayoko Horai of Sojo University in Kumamoto explained how activities are used to make connections between students’ required course work and self-access learning. Although Sojo University has a SAC, some felt the students had few opportunities to gain cultural knowledge. To address this need, a project was launched to encourage students and teachers to interact with one another to increase cultural understanding. The project had students engage in various activities, including gathering information from foreign teachers, making posters, and planning events. In addition, students created activities for the classroom. Horai reported that these activities have resulted in better connections between students, teachers, and advisors, as well as between the curriculum and the self-access center. Magical Workshop for better self-study: are there any “magical” ways for self-study? The Self Instruction (SI) room was opened as a SAC in 1988 at Chubu University, in Aichi prefecture. The presenters, Seiko Oguri and Tetsuo Kato, explained that, whereas the SI room has a wide variety of language materials, learners require support so that they understand how to study more effectively on their own. In response to this need, the Magical Workshops were begun in 2011. The title word ‘magical’ apparently reflects that these workshops can transform participants into effective, self-directive learners. Over the past four and a half years, 42 workshops have been conducted with 345 learners participating. Oguri and Kato emphasized that the Magical Workshops are different from regular classes. Unlike classroom instruction, there are no grades or traditional teaching, and participants can expect more activities, talking, encouragement and laughter. A range of workshops have been offered, but the most frequently offered ones are related to vocabulary, reading, grammar and oral skills. According to the students who have joined the workshops, the Magical Workshops make them want to study more, improve self-study methods and help them to better use the materials in the SI room. Oguri and Kato said that these workshops encourage and support learners, and provide them with a variety of ways to navigate the SI learning materials. In this way, the Magical Workshops help the learners to continue learning on their own. Advising in language learning: What can conversation analysis tell us? Mathew Porter of Fukuoka Jo Gakuin Nursing College and Yukari Rutson-Griffiths of Hiroshima Bunkyo Women’s University presented their study of an advising session between an experienced advisor, Ruston-Griffiths, and a learner. The learner was a non-English major at a university who would need to use English in the future as an elementary school teacher. The 70-minute session was video-recorded, transcribed and analyzed. Porter and Rutson-Griffiths referred to Kelly’s (1996) micro and macro skills for advising, and in this analysis, they focused on the three micro skills of interpreting, reflecting feelings, and empathizing. Their study examined the discourse moves of the learner and the advisor through use of conversation analysis (CA). Porter and Rutson-Griffiths’ analysis showed how the experienced advisor moved the dialog toward the goal. This was done through cyclical maneuvers in which the advisor requested information about the learner, sought confirmation of understanding and then offered advice. Porter and Rutson-Griffiths emphasized the importance of maintaining a shared understanding, which involves interpretation and repair. They believe that CA is a useful tool for showing how advisors can move advising sessions toward the mutually shared goal of advice. Umida Ashurova of Nanzan University in Nagoya told the story of a remarkable learner, Risa Hayashi, whom she got to know at Sugiyama Women’s University over a period of four years. Risa very much epitomized the autonomous learner from the time she was a junior high school student through to the present, three years after having graduated from university. Even before she entered university, Risa had a strong desire to learn English and she took control of her own learning. For example, she communicated with her assistant language teacher (ALT), joined an English club, and listened to English radio programs. At university, Risa took advantage of the available resources, but she also fought to improve things in ways which better reflected the perspective of the students. For instance, she successfully negotiated changes to regular English quizzes which she thought were poorly designed. Risa also challenged the services offered by the SAC, arguing that they needed to be “of the students, by the students, for the students.” Risa and other students began to make changes in the SAC: peer advisors started new projects, volunteers organized lunch time events, and they also maintained the program website. Perhaps most impressive was that Risa led a group of students to hold a conference on self-access learning. Risa is now working but she continues to carry out self-directed learning. The JASAL 10th Anniversary Conference provided many opportunities for participants to share ideas. While the presentations represented more structured ways of exchanging ideas, the SAC tour and break times allowed for more casual discussions related to self-access. Considering that this was the first time that JASAL held a full day conference, the JASAL committee must be congratulated on a fantastic job of organizing the event. Since its inception in 2005, JASAL has continued to grow as an organization and there is no doubt that it has contributed toward the increased awareness and development of self-access learning in Japan. Looking ahead, JASAL may consider how future conferences and events can further influence and promote self-access learning in Japan. JASAL could encourage more school administrators to participate and welcome individuals to share ideas in Japanese. Andrew Tweed is a doctoral candidate in the Ed.D. TESOL program at Anaheim University. He has worked as a teacher trainer in Southeast Asia, and currently teaches EFL at Nagoya University of Foreign Studies in Japan. Andrew’s research interests include learner autonomy and English language education in East and Southeast Asia. Benson, P. (2011). Teaching and researching autonomy (2nd ed.). Harlow, UK: Routledge. Kelly, R. (1996). Language counseling for autonomy: The skilled helper in self-access language learning. Taking control: Autonomy in language learning (pp. 93-114). Hong Kong: Hong Kong University Press. Murray, G. (2014). Exploring the social dimensions of autonomy in language learning. In G. Murray (Ed. ), Social dimensions of autonomy in language learning (pp. 3-11), Basingstoke, UK: Palgrave Macmillan. Reinders, H. (2012). Advising in context: Towards pedagogical and institutional integration. In J. Mynard & L. Carson (Eds. ), Advising in language learning: Dialogue, tools and context (pp. 3-25). Harlow, UK: Pearson. Yamashita, H., & Kato, S. (2012). The Wheel of Language Learning: A tool to facilitate learner awareness, reflection and action. In J. Mynard & L. Carson (Eds. ), Advising in language learning: Dialogue, tools and context (pp. 3-25). Harlow, UK: Pearson.